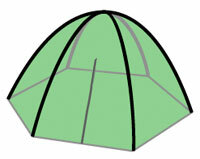 The shape and style of the tent determines its overall stability and defines the internal dimensions. 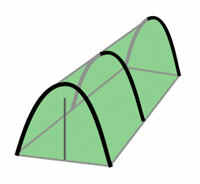 Probably the most common, Dome tents are constructed from 2 or more intersecting curved poles to form a square or round covered area. These tents are very popular in Walking, Hiking & Backpacking as they combine great strength with the least use of material and weight. The internal space offered is good and some models are freestanding - only requiring a few pegs to keep it on the ground in very windy conditions*. One, two or three 'hoops' form a tube with curved walls to provide a relatively large volume to ground surface ratio. These Tents are also surprisingly strong as they divide pressure over the full length of the hoops a bit like an arched bridge. 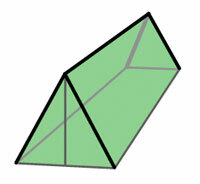 The curved walls give much bigger internal volume than the traditional A-frame (see below) over the same ground area. These tents are very stable particularly if pitched end on into any wind. These are the most lightweight so are often favoured by backpackers. However, there is not much room inside because the pole is always in the way. Little more than a bivouac they are really only suitable for a quick shelter in light weather conditions. This traditional two legged frame is found at the outer ends of the tent, the fabric or skin forms a triangular space providing good head-room in the middle. The steep sides mean that water (or snow) drains well but the rigid tent poles mean that they are often quite heavy. 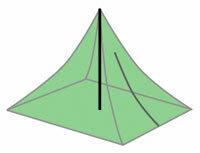 As a result this classic tent shape is now becoming less and less popular due to the relatively poor weight to strength ratio. By adding a center semi-hoop to a traditional A-Frame you can to create a larger volume version of the traditional A-frame tent. Whilst it improves the situation, the weight to strength problem still persists.